The Sea Cadet Centennial kicked off with some excitement during the Navy and Coast Guard Day’s reception on November 21, 2018 in Ottawa. It was here that Chief Petty Officer First Class (CPO 1) Maude Maisonneuve, Sea Cadet of the Year, received the very first commemorative centennial pin from Rear-Admiral Ron Lloyd, Commander of the Royal Canadian Navy. “The Navy League of Canada has been proudly supporting Canada’s future leaders since 1918, and we couldn’t be happier to be celebrating this world-class youth program with our partners in the Canadian Armed Forces this upcoming year,” says Earle Corn, National President of the Navy League of Canada. The evening featured a number of notable speakers, including Speaker of the House of Commons Geoff Regan, Minister of National Defence Harjit Sajjan, and Minister of Fisheries, Oceans and the Canadian Coast Guard Dominic LeBlanc, who all were able to say a few words before having to head back to the House of Commons for a late-night vote. Minister of Veterans Affairs Seamus O’Regan also was in attendance with fellow parliamentarian Elizabeth May. Mr. Jeffery Hutchinson, Commissioner of the Coast Guard, was the last speaker before the official pin presentation. CPO 1 Maisonneuve graciously accepted the gold Sea Cadet Centennial Pin on behalf of all Sea Cadets who are now authorized to wear it on their uniforms until December 31, 2018. This special event was only the first one of a series of centennial activities planned across Canada to commemorate 100 years of the Royal Canadian Sea Cadets. Our own Royal Canadian Navy will be one of our featured partners while we celebrate this year, and will be hosting a number of special maritime initiatives for not only the Royal Canadian Sea Cadets, but for all Canadians. In addition to all of the exciting activities that Sea Cadets normally participate in, such as international exchanges, sailing opportunities and on-water activities, Sea Cadets can expect to participate in even more familiarization activities aboard Royal Canadian Navy and Canadian Coast Guard ships. They will also have the opportunity to sail on tall ships, while at the same time taking advantage of opportunities to engage and celebrate with their local communities, gaining valuable skills, perspectives and experiences that you just can’t get anywhere else. Throughout the evening, CPO 1 Maude Maisonneuve was calm and composed as she met with the various dignitaries in attendance, and seized upon this unique opportunity to proudly act as the only youth representative that night. To Maude, being Sea Cadet of the Year is not only a remarkable achievement, but also comes with the responsibility to be an ambassador for all Sea Cadets, giving them a voice where they otherwise may not have one. 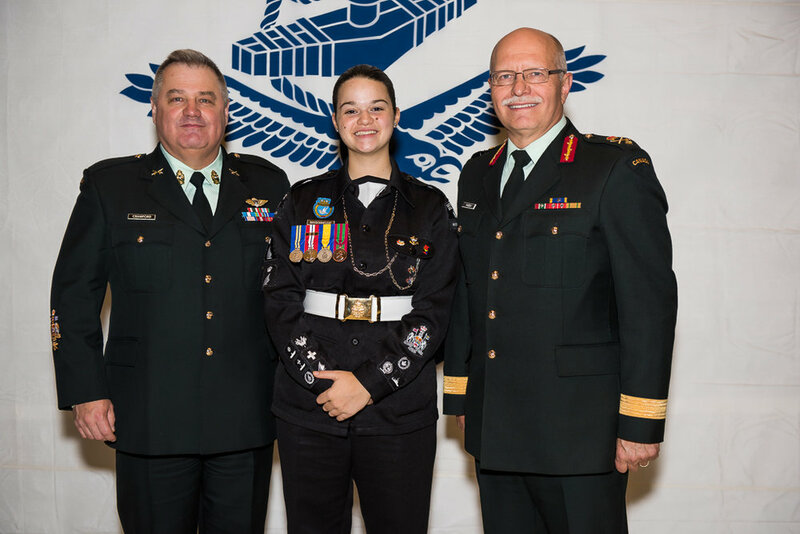 Originating from Oka, Quebec, CPO 1 Maisonneuve is the most senior cadet in her corps, Royal Canadian Sea Cadet Corps 300 Boisbriand; she learned she was awarded the Sea Cadet of the Year at her annual inspection last spring. Even if this honour came as a surprise, she takes her role very seriously and hopes she can inspire other youth to work hard and make the necessary efforts to achieve their goals. “My parents are great leadership models and always encouraged me. I was very fortunate to have people that cared about me and made sure I was trying new things and developed as a leader. I am very grateful,” says CPO 1 Maisonneuve. And we couldn’t have been more grateful for an inspiring young woman such as CPO 1 Maisonneuve to represent the more than 7,000 Royal Canadian Sea Cadets at this momentous occasion.